The decision to purchase an apartment is an intensely personal, but also a critical one, as it can have lasting financial and emotional repercussions. In order that the decision proves to be wise and adds value to the investor, investing in a reliable real estate project is de rigeur. Currently, there is a surge in the construction of apartment projects in Colombo’s prime areas, which leaves prospective buyers perplexed and confused as to which one would make for the ideal investment. This is where a trusted name with proven credentials provides an ideal marker for an astute investor. As the pioneer and forerunner of the construction industry in Sri Lanka, the Sanken Group is a trusted name for decades now, synonymous with ethical operations and timely delivery, coupled with its hallmark construction quality. Responsible for over half of Colombo’s skyline, the Sanken Group has sustained its impeccable credentials time and again by delivering landmark commercial and residential projects that deliver the highest quality standards and stand the test of time. Rooted in the Fortune 500 Mitsui Construction Company of Japan, the Sanken Group has maintained the high standards, skills and engineering culture of its Japanese origins. Having delivered a slew of valuable real estate projects which are landmarks in the country, the Sanken Group consists of 17 subsidiaries and associate companies dealing primarily with the real estate and construction industry. Backed by engineering excellence and superior quality systems, the company has become synonymous with quality construction, spearheading some of the most prominent landmark structures in the country: Gregory’s Seventh Sense, On320 Apartments, Empire, Emperor, Cinnamon Red and The Movenpick, to name but a few. The Sanken Group has also successfully expanded overseas into 12 countries. Since both Capitol Development and Sanken Construction belong to the Sanken Group, its projects enjoy synergistic strength of the group such as timely delivery and quality construction, which means that investors stand to see better returns on their investments. 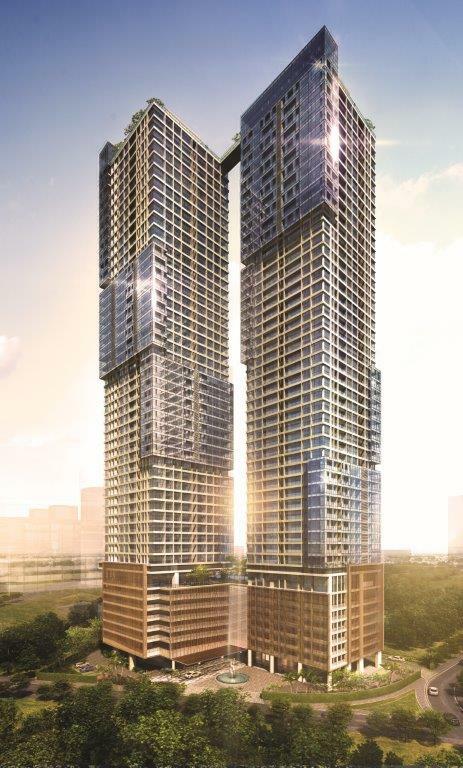 Capitol TwinPeaks, the latest project by Capitol Developers – a 50-storey skyscraper project, being constructed by the Sanken Group – is steaming ahead of schedule. With 50% of sales already completed and the basic structure being 6 months ahead of its original plan, this project will exemplify exclusive luxury city living through design, construction, aesthetics, quality and experience. Location is everything and Capitol TwinPeaks has a lot going for it. Apart from the lake frontage, it is located in a highly commercial area. It will in time prove to be an ideal home for professionals who flock to the area. In fact, the Urban Development Authority has pledged to develop the Beira Lake environs with improved infrastructure to render it an exciting entertainment and shopping hub, rendering it easy to rent/sell and customize Capitol TwinPeaks. As a result of its unmatched group synergies, Capitol Developers is offering customers a unique opportunity to purchase apartments on top of each other at Capitol TwinPeaks. This enables owners to create a duplex, or a two-storey apartment. A duplex apartment is a single apartment spread over two floors, connected by an indoor staircase, thereby becoming just like a two-storey house that many in Sri Lanka are used to. Another key factor attracting investors to Capitol TwinPeaks is the fact that it offers 38 types of units. Since the building is purely residential, it offers enhanced privacy as compared to mixed development buildings in the area. Sanken’s promise is evident in the fact that 27 floors are already complete and with 23 more poised for construction, which is well ahead of schedule. Unparallelled location and timely delivery are important factors to consider when planning for the best return on investment to safeguard investors’ financial planning. This is where investors can rest assured when entrusting their faith with Sanken. Capitol Developers and Sanken provide a one-stop shop professional service, providing investors with a construction schedule and regular updates. A study of the high profile past projects by both parties denote security and safety for potential investors today. With a benchmark name like Sanken spearheading Colombo’s transformation, investors are making an informed choice to invest in Capitol TwinPeaks.